The increasing affordability of sequencing technologies offers many new and exciting opportunities to address a diverse array of biological questions. 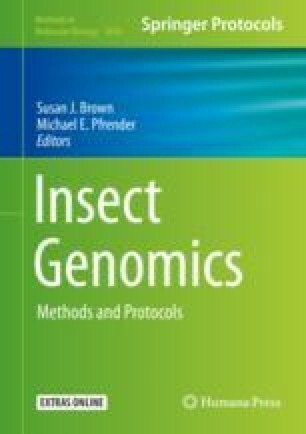 This is evidenced in entomological research by numerous genomics and transcriptomics studies that attempt to decipher the often complex relationships among different species or orders and to build “omics” resources to drive advancement of the molecular understanding of insect biology. Being able to gauge the quality of the sequencing data is of critical importance to understanding the potential limitations on the types of questions that these data can be reliably used to address. This chapter details the use of the Benchmarking Universal Single-Copy Orthologue (BUSCO) assessment tool to estimate the completeness of transcriptomes, genome assemblies, and annotated gene sets in terms of their expected gene content. R.M.W. was supported by Swiss National Science Foundation award PP00P3_170664.